As many of you know, I really love macaroni and cheese. The stuff that comes in a box. A blue box, from Kraft. Yes, I really love it. I do. The orange powder. Yum. Addictive, even. And sadly, not easy to come by in this little corner of the world. Thus, I jump at pretty much all recipes for homemade macaroni and cheese, and when Kevin announced that he'd host an event to collect many such recipes - I knew I had to participate. I got Jamie Oliver's new book, Cook with Jamie, for christmas. I have a lovely husband. And this book has what looked like a very promising recipe for macaroni and cheese. So I went ahead and made this for New Year's Day - a lazy day when carbs and fat was exactly what we wanted. And the verdict? Well, it's a nice enough dish. Sure. But honestly, for almost half a kilo of cheese, I expected something with a bit more oomf. I can think of many better things to do with that much cheese - and this is just not great enough. But I'm really looking forward to eating my way through many other nice macaroni cheese recipes - bring them on! Preheat the oven to 200 degrees, and boil your pasta in salted water. Remove it about two minutes before it's done and drain, but save some of the pasta water. Melt the butter in a small saucepan, and add the oregano. Fry for a few minutes, then lower the heat and melt the taleggio, mascarpone and parmesan. Add a few spoons of pasta water until you have a smooth sauce. Mix with the drained pasta, adding more water as needed, and season with plenty of grated nutmeg. Transfer to an oven-proof dish. Top with torn pieces of mozzarella, and a bit more grated parmesan if you'd like. Bake for 10-15 minutes. Turn the oven to "grill", and bake for just a few minutes more, until the top is golden and crunchy. I'm always trying new mac n cheese recipes too. I think the cheese is the most important ingredient - it usually needs a good cheddar or a blend of a good cheddar and other cheeses for me to 'love' it. The cheeses in this recipes sound delicious but a bit bland, besides the Parmesan (I'm not familiar with taleggio). 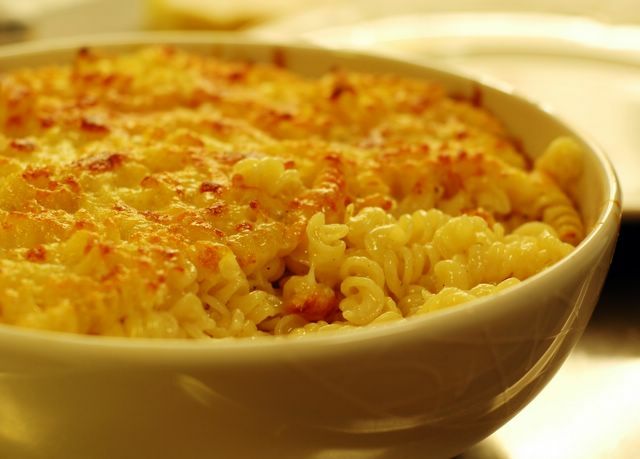 Have you tried Alton Brown's Stovetop Macaroni and Cheese recipe? I've made that one quite a few times. The recipe is on the Food Network site. My favorite baked recipe so far was Horn and Hardart’s Baked Macaroni and Cheese, which is a pretty standard recipe but the cheese blend I used just really hit the spot that day. It has a bit of tomato in it too. Sorry, Anne--not trying to be Anonymous--I just realised I didn't put who I was in the post! very nice post, thank you.In English the expression is "oomph" (rather than "oomf" though the proununciation is the same). I love Mac and Cheese so much that I have to have it now for tonight's dinner. I'm a mac-n-cheese traditionalist -- you gotta use cheddar, sharp cheddar. I love Kraft mac n cheese, too. Total guilty pleasure. 2nd best is velveeta mac n cheese. Cook the macaroni, cube the velveeta, stir it into the macaroni, thin it with a bit if milk if you'd like, add a generous amount of pepper. And I hate "cheese product" but you just have to make an allowance for mac n cheese. I think one of the ways to use less cheese and improve the flavor is to make a white sauce (bechamel) and incorporate the cheese into that. Lorenza DeMedici has a good recipe for bechamel. The problem with that Mac and Cheese recipe is that there's no cheddar in it! Here's a link to my absolute favourite recipe for Mac and Cheese, from singer Patti LaBelle: Over the Rainbow Macaroni and Cheese. Hi - I've been trying to remember a recipe I tried some years ago, but then lost. All I can remember is that it had cheddar and smoked gouda and 2 or 3 other cheeses. I think I agree that stronger flavored cheeses mixed with good melters, maybe some fontina is one way to go. It might be a case of finding the blend of cheeses that appeals to your taste. Good luck...cheese is the best. Oh, I like the Blue Box too, and so much so, that this is the first time I made Mac and Cheese baked in the oven. It was good, but I made mine with blue cheese for extra sharp flavor. I think that your friends in the USA need to mail you boxes of the blue box! I still hold Nigellas basic MacnCheese recipe from How to Eat as my fav. Basic, with sharp cheddar and some english mustard. Problem in sweden is to find propper macaroni. Elbow kind is to thin. I did stock up on ICAs own brand but they did change it reacently. To bad. I think the point with his twist on mac and cheese is "not your old frumpy mac and cheese". With an open mind I tried this recipe and was quite pleased. It was quite a fantastic dish and compared to what is in that little blue box (who knows what is in there for sure) I like the fact that I know what I am eating. I know chedder is what you expect, sometimes an open mind can really turn you on to new experences and hey add chedder to the recipe and see what happens! The recipe looks good. I like to add jalapeños, dollops of cream cheese, with a sourdough crust.